Develop custom-branded corporate gifts for your clients and events. When you work with Saul Good Gift Co., we’ve got you covered with a reliable, easy way to deliver quality client gifts that make people feel appreciated and make a lasting impression. With over a decade of experience working with Canada’s top companies, our dedicated team takes you from start to finish to create your gifts, add custom branding, and arrange delivery. 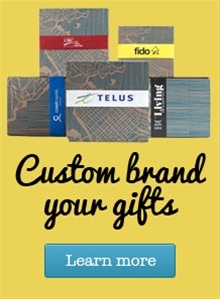 Put your business front and centre with custom branding options. Qualify for preferred pricing when you buy more than 12 gifts a year. Relax! Our team is working hard to create and deliver memorable corporate gift experiences on your behalf. To learn more about our corporate gift options, or to get started, fill out the form below.